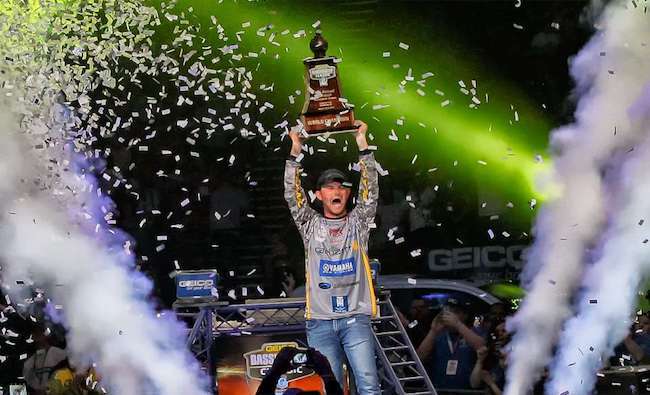 When he won the Bassmaster Classic a year ago, he cemented his status as one of the bright young stars of our sport. By winning it back-to-back, Jordan Lee has cemented his status as being a future legend in our sport. Much as he did a year ago, the 26-year-old made a final day comeback on Lake Hartwell to be only the third angler to with back-to-back Classics – Rick Clunn and Kevin VanDam are the other two. While not as dramatic as his one-spot, broken-lower unit, 15th-to-first victory at Lake Conroe, Lee still managed to climb from sixth the hoisting the trophy thanks to a stellar final day, as he held off Brent Ehrler by 1 pound. Lee went into the tournament with no set plan other than to fish to his strengths, targeting boat docks. With what changed by the day, as he alternated between a Strike King Rage Swimmer Swimbait, Strike King Ocho, Strike King KVD Perfect Plastics Shim E Stick, a jerkbait and a vibrating jig. The non-plan worked perfect day one, as he sacked up more than 18 pounds, but day two saw a significant drop in weight as he failed to get any big bites. More than 6 pounds behind Jason Christie going into Sunday, once again everything lined up perfectly. He found a pocket with 57-degree water temps and immediately coaxed a big bite from under his first dock. After that, he said “they were swimming around every dock.” He managed to sack up more than 16 pounds, but he actually thought he’d lost his chance to win when he lost a fish in the 4 ½-pound range right before coming in. Turns out, Christie once again couldn’t close the deal on the final day – he led going into the final day on the 2015 Classic at Grand Lake before losing to Edwin Evers – allowing Lee to claim his second-straight Classic title. Now, as for where he ranks, Lee really can’t move up much higher. He was already ranked third going into the event, and he remains in third after. He wasn’t even able to gain much ground on Jacob Wheeler, and the No. 2-ranked angler finished seventh at Hartwell. Currently there are seven Elite Series anglers ranked in the top 10, and five finished within the top 10 at the Classic. James Elam nearly made it six, as he finished 11th, and Dustin Connell only brought in three fish the final day to slip to 23rd.